The gravestones, headstones, and memorial markers found in the Charles Baber Cemetery are personalized to each person buried here. The type and design of the memorial markers are based on either the wishes and choice of the deceased, or upon what the family or loved one chose for the deceased. There are no restrictions on the size, shape, design, or material composition of the headstones as long as they remain within the boundaries of the plot. This allows the individual or the family members of the loved one to customize the marker to the religious, ethnic, and personal preference of the person who passed away. This freedom of marker selection provides for a wide and interesting variety and uniqueness of the markers while presenting an offering of architectural and artistic beauty. 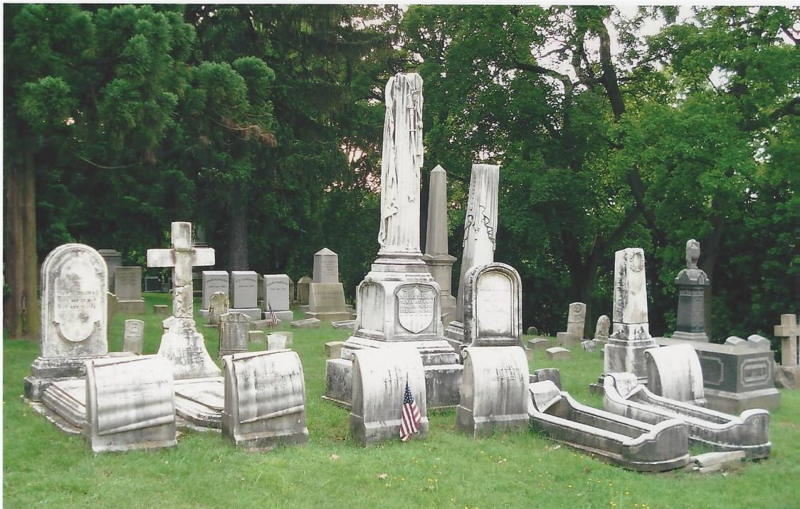 With headstones dating back to the mid 1800s, the change in the material composition, designs, and artistry of the markers can be seen as one walks the paths of the cemetery. Many of the older markers were simply called slabs or tablets. Material composition was slate, sandstone, brownstone, and limestone. 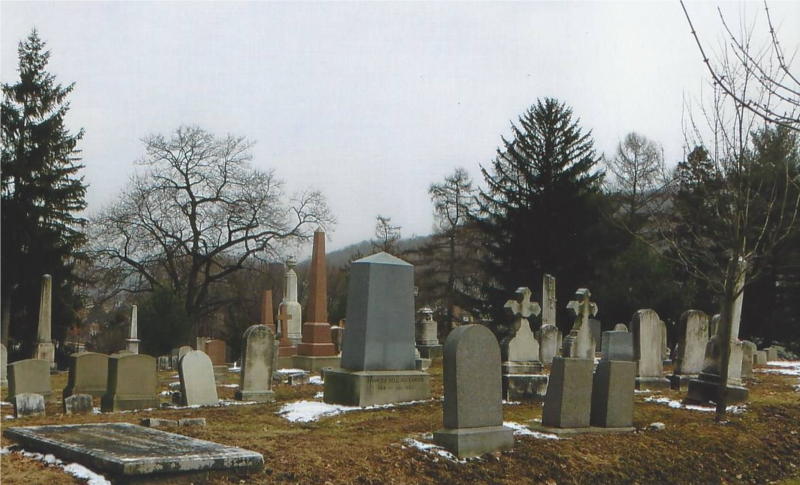 As Pottsville grew, as the monument industry grew after the Civil War, and as craftsman and materials became readily available, the markers became large and stately with carved traditional symbols of ivy, urns, torches, crosses, etc. Marble was used for a time for the markers because it was soft and pliable; however, it was not durable and it did not weather well with the elements. With the Industrial Revolution and the invention of steam power, granite, which is a harder stone and more durable, could be used. Granite is now available in many colors and hues, and is the dominant stone of choice today. The swift advancement of computer and laser technology in recent decades, allows the stone’s surface to be personalized and customized. The etchings can be a portrait of our loved one, or their favorite sport, hobby, pet, comic character, or business occupation. Or the stenciling and etching can be a combination of any of these. Some also carry the emblem of the armed forces they may have served in. This personalization gives comfort to the family that the loved one’s memory lives on and is not forgotten. Each marker tells its own story. 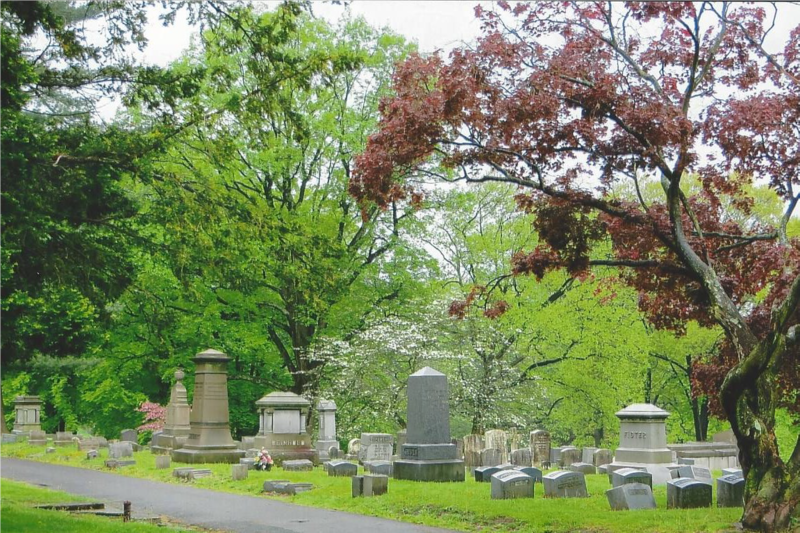 You are invited to walk the paths of the cemetery to view the many styles, designs, and artistic architecture of the markers. In addition to the older slab and tablet markers, and the standard marker, there are cradle, box, hip, chest, block, monolith, obelisk, column, pedestal, and eclectic markers, two mausoleums, a tumulus, and a columbarium. If you are unable to personally walk the grounds, the links provide you with a sampling for the memorial markers found at Charles Baber Cemetery.